Enjoy - Food & Travel: Along Akerselva (Aker River): House of "Hønse Lovisa"
Along Akerselva (Aker River): House of "Hønse Lovisa"
By the Beyer Bridge, you see a little red wooden house. It was built around 1800, for the Master at the "Monsesaga" Sawmill. It is the last of a large number of small houses that used to be located by the river. 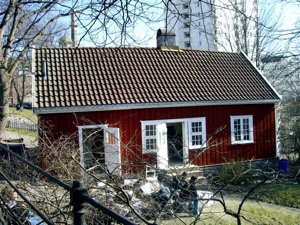 The house is named after "Hønse-Lovisa". a strong and warm character from "Ungen", a play of the Oslo playwright, Oskar Braaten from 1911. Today you can stop by and enjoy a cup of coffe and a waffle with sour cream and jam, before you stop to admire the waterfalls just by.